Hello, boys and girls. Today we are going to the town of Jericho and learn just how much God loves everyone...even bad people. Here we will meet a little man by the name of Zacchaeus. Zacchaeus is hated by all the people of Jericho, because he is the chief tax collector. Being a tax collector is not a bad job, unless you cheat people doing your job. Zacchaeus has been telling the tax collectors to take more than they should from all the people in Jericho, and this is why the people hate him. I was told that there was going to be someone special visiting Jericho today. Let's go and see if Zacchaeus knows who this visitor is. "Hello, Zacchaeus, we are here to visit Jericho and to meet the visitor that is to come here today. Do you know who the visitor is? " "Hello, boys and girls. I hear that the man visiting our town is a man by the name of Jesus and I really want to see just who Jesus is and hopefully get to meet him. If we hurry, we can get ahead of the crowd and maybe get to see him. I know where there is a sycamore tree just up the road and if I climb up that tree, I can see him. You see, I am very short and most everyone in town is taller than I am. Let's go quickly." "Come on, boys and girls, maybe we too can see this man named Jesus. You know that Jesus is God's son and he came here to live on earth with all the people." "Don't fall Zacchaeus. You are really up quite high in that tree." "Don't worry. I have done this a gazillion times and I haven't fallen out yet. Look! Boys and girls, here comes Jesus. I hope he stops here so I can at least get to see him and maybe speak to him." "There he is, boys and girls. Jesus is standing here just below the sycamore tree that Zacchaeus has climbed. I hope he will see Zacchaeus and speak to him. He really wants to see him and find out who he is." Jesus is speaking to Zacchaeus. I wonder what he is saying to him. I'm glad that Zacchaeus got to meet him and at least speak to him. Let's listen as Jesus and Zacchaeus talk and see what Jesus says to him. Jesus told him to come down out of that tree. Why I think Jesus is going to Zacchaeus's home for dinner. Imagine that! Jesus is going to eat with the most hated man in Jericho. I'm not sure that Zacchaeus really knows who Jesus is, but I'm sure Jesus knows who Zacchaeus is. There has to be a very special reason for Jesus wanting to go to Zacchaesu's house for dinner. "Come, Jesus. I will have my servants prepare a meal and we can share it together. I will gladly welcome you to my home," Zacchaeus says as he scrambles out of the sycamore tree. 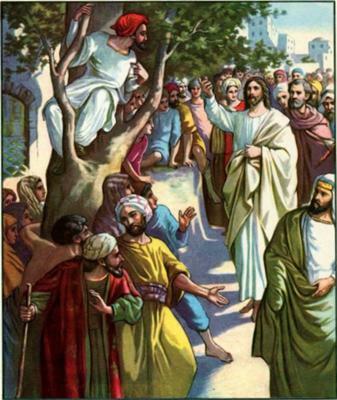 "Careful, Zacchaeus, you are going to fall coming out of that tree if you are not careful." "I have to hurry! Jesus is coming to my house for dinner and I have to get things ready for him. I must hurry. I'm not going to fall." Now the people in the town of Jericho know the kind of man that Zacchaeus is and they are very surprised to see that Jesus has chosen to go to his home instead of one of their homes for dinner. They even called Zacchaeus a sinner or someone that does bad things. Most of the people of Jericho know who Jesus is and this is not what they expected from Jesus. There must be a reason for Jesus to go to Zacchaeus's home. Let's see what happens next. "Did you hear that, boys and girls? Zacchaeus has said that he is going to give half of all he owns to the poor and if he has cheated anyone out of anything, he will give them back four times what he took. What has happened to Zacchaeus? He has always taken from people. This is certainly not the man we met this morning. Does this mean that Zacchaeus is a changed man? Is he not going to cheat anyone ever again? Let's listen and see what Jesus is saying to him." 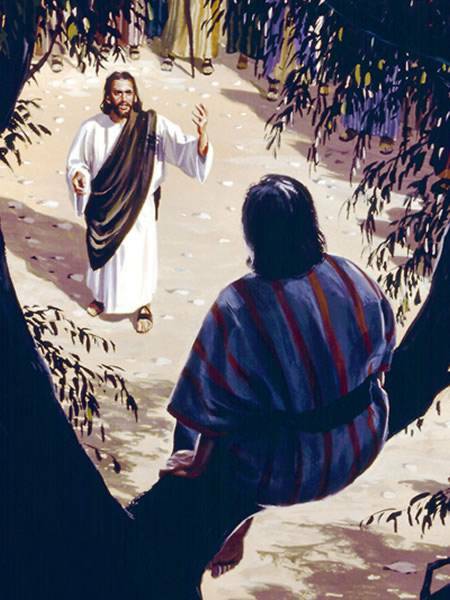 It seems that Jesus is pleased with what Zacchaeus has said and has told Zxacchaeus that he is saved, because he has admitted that he has done wrong and wants to do what he should and not continue to do wrong any more. Jesus has told him that he came to find and save those who were lost. The A B C's of becoming a Christian. I want to take this time to tell you about how you can become a Christian just like Zacchaeus did in our adventure today. First is the"A": This stands for Admit. We must admit to God that we are sinners or that we have done wrong things and tell God that we are sorry. We must try never to do these things again. A verse in the Bible that explains this is found in Romans 3:23. It says, 'For all have sinned and fall short of the glory of God.' This simply tells us that we have all done wrong things. No one is any better than anyone else. We are all the same. Second is the"B": This stands for Believe. We must believe that Jesus is God's son and that he came to earth to live and that he died for our sins on the cross. A verse in the Bible that explains this is found in John 3:16. It says, 'For God so loved the world that he gave his only begotten son, that whosoever believes in him should not perish, but have everlasting life.' This tells us that God created us and that he loves us so much that gave us his son Jesus to die on the cross for all the wrong things that we have done or will ever do just so we can be with him when we die. Third is the"C:" This stands for Confess. We must ask Jesus to come into our hearts and live in our hearts and then we must to tell others that we have asked Jesus into our hearts. A verse in the Bible that explains this is found in Romans 10:9. It says, 'That if you confess with your mouth,"Jesus is Lord," and believe in your heart that God raised him from the dead, you will be saved.' This tells us that when we ask Jesus into our hearts to live and believe that Jesus was raised from the dead, we must then tell others what has happened. When we do this, then we can be saved. If you are feeling a little voice inside you telling you that you need to ask Jesus into your heart, I would like for you to pray this prayer with me. Dear Jesus, I know that I am a sinner and I ask you to forgive me. I thank you for dying on the cross for my sins and I believe that you were raised from the dead. Jesus, I want to ask you to come into my heart today. Amen. The story today tells that Jesus went to visit in the home of the most hated man in Jericho. God loves everyone no matter what they have done, who they are, the color of their skin, the language they speak, or if they are rich or dirt poor. GOD LOVES EACH AND EVERY ONE OF US. Jesus came to Jericho just to see Zacchaeus. He wanted Zacchaeus to be saved, because he loves him just as God loves him. Zacchaeus had that little voice inside his heart that was telling him to ask Jesus into his heart. This is why he wanted to see Jesus so bad and wanted to know who Jesus was. This is what God wants for every one of us. He wants us to ask Jesus to come into our hearts. There will come a time when you will feel a little voice inside you that is telling you to ask Jesus into your heart just as Zacchaeus really wanted to see who Jesus was. This little voice sometimes makes you feel a little uneasy, but it is God's way of telling you that it is time for you to ask Jesus into your heart. How can I know that this is really the time for me to ask Jesus into my heart? A question that you may have is how can I know that this is really the time for me to ask Jesus into my heart? There will be a little voice or feeling that will come at a time when someone is telling you about Jesus or when you are at church and your preacher is telling you about Jesus and asking people to come down the aisle to ask Jesus to come into your heart. You will feel like you need to go down and tell him that you want to be saved. How will I know if Jesus has come into my heart and I am saved? Another question you may have is how will I know if Jesus has come into my heart and I am saved? This one is easy. If you invite Him into your heart, He will ALWAYS take you up on the invitation! That means, once you ask Him, you know that He's with you. I was seven years old when I asked Jesus into my heart and to this day I still feel that joy in my heart when I think back to that day April 28, 1951. Just to think back, tears come into my eyes I was so happy that all I could do was cry tears of joy. I thought my little heart was going to burst open. and that maybe some day soon you will ask Jesus into your heart if you haven't already. Let's say a prayer before we end our journey. Dear Jesus, Thank you for coming and dying for my sins. Thank you for living in my heart and always being there for me. I love you dear Jesus. Amen. you have forgiven my sins.,you have saved me from Drunk addict made me a new one with your Holy blood. U have written my face on your hand.love you jesus. Jesus thank you for saved me from sins and gave me free Salvation. Now in my heart i feel with glory. i was lost but now i found in Jesus name. Amen!!!!! jesus is a bleassed person.